October’s here, which means it’s time for fall jackets, pumpkin spiced-everything, and some highly-anticipated concerts to look forward to. From a pair of twins to a pair of Rock & Roll Hall of Famers, there’s a little something for all musical tastes this month. Sit back, relax, and enjoy the shows Calgary! Everything is awesome for The Quin twins in 2016 – they just released their eighth studio album Love You To Death to rave reviews and their fall tour is selling out quickly. Fans can expect the 100-minute show to include new singles “Stop Desire” and “White Knuckles”, both of which were produced by Greg Kurstin of Sia and Adele fame. Another set of famous twins are set to rock Calgary this month, as Charlie and Craig Reid of The Proclaimers will take over the Deerfoot Inn & Casino stage on October 8. The dynamic duo have released ten albums over the course of their 30 year career, but we have it on pretty good authority that “500 Miles (I’m Gonna Be)” will be included in their set. School’s back in session for Alice Cooper. The Rock & Roll Hall of Famer spent the summer touring with supergroup Hollywood Vampires and is back to solo gigs this fall. Fans who shell out the big bucks for the “Front Row Insanity VIP Experience” get a prime seat, a meet & greet, and a backstage tour where they can snap photos with their heads inside Cooper’s personal guillotine. Calgary gets a double-dose of Nineties-goodness when Canadian rockers Our Lady Peace team up with I Mother Earth for what’s sure to be a big, shiny performance on October 19. And for an extra $250, fans can upgrade their current tickets to the “Acoustic Happy Hour VIP Package” which includes a private, combined performance by OLP and IME and a meet & greet with members of both bands. Toronto folk rockers The Strumbellas released their third studio album in April and are on the road until next April to promote it. First single “Spirits” made a nice dent on Canada’s Alternative music chart and followup “We Don’t Know” is destined to do the same. Vancouver’s The Zolas will open for the band. California’s most fortunate son is coming to the Scotiabank Saddledome with a show featuring solo hits and songs from his time spent as the frontman for Creedence Clearwater Revival. Be sure to cheer extra loud, as Fogerty records each of his live shows and offers them for purchase on his website for $12.99. Edmonton EDM duo Purity Ring are set to to tear the roof off of MacEwan Hall on October 22. The Juno-nominated pair keep their live shows fairly low-tech: DJ Corin Roddick controls the sound and lights onstage with a custom-built, tree-shaped device, and singer Megan James makes their outfits from scratch. Tickets: Available online for $30. 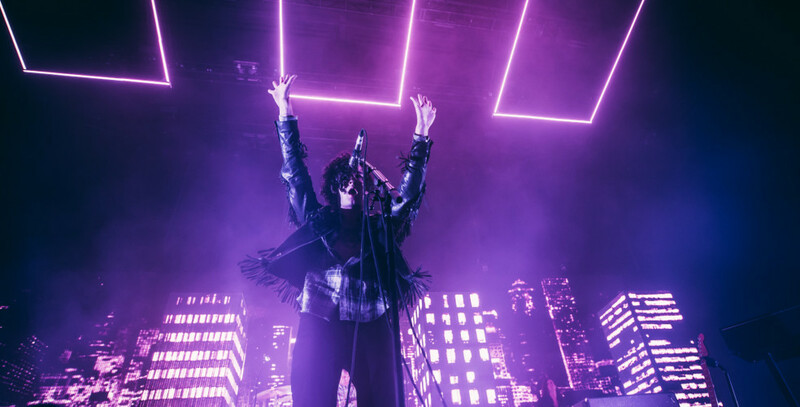 British alt-rockers The 1975 took the world by storm three years ago as openers for big-time acts like Muse and the Rolling Stones. The exposure won them a devoted legion of fans and their second LP I Like It When You Sleep, for You Are So Beautiful Yet So Unaware of It debuted at Number One on Billboard’s Album chart last February. Sydney’s Boy & Bear will say “g’day” to Calgary on October 26. The band has topped the charts in their native country with all three of their studio albums and have collected 5 ARIA awards (the Australian equivalent of the Grammy) along the way. Rapper Austin Richard Post (aka Post Malone) scored a modest hit last year with “White Iverson” which led to a spot opening for Justin Bieber on his Purpose Tour. Malone and Bieber have since collaborated on “Deja Vu”, the lead single from Malone’s upcoming album Stoney. Jazz Cartier, who Pitchfork referred to as “Toronto’s first post-Drake rapper”, will open for Malone on his fall tour. It’s been a relatively quiet year for Gavin Rossdale (save for that album Gwen Stefani wrote about him), but he and the other members of Bush have embarked on a fall tour that touches down in Calgary on October 29. Fans can expect to hear hits like “Machinehead” and “Mouth”, in addition to “People At War”, a new song the band released on World Refugee Day in June.